While many of us were excited about attending the 2015 meeting in sunny and warm Orlando, FL, the record setting low temperatures in Florida, while nothing compared to the Northeast, had many of us scrambling for coats and jackets. Nevertheless, the 2015 Annual Scientific Meeting was filled with events, education, networking, and collaboration between sections thanks in part to the many members of the General Section who attended, served on committees, and presented scientific presentations. A special thanks to our workshop and breakfast session presenters and organizers who contributed to our highest level of workshops and breakfast sessions in recent years. Thank you again for your contributions, presentations, and time. General Section Academy Cup Team Members (l to r): Brian Clark, Paul Kish, Betsy Maldonado, Alan Boehm, Julie Howe, Amber Riley, Claire Shepard, Gina Londino, Janean Fossum, and John Gerns. 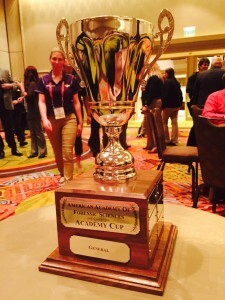 2015 Academy Cup awarded to the General Section during the 2015 Annual Business Meeting. On Wednesday morning, several members of the General Section participated in the Academy Cup competition. 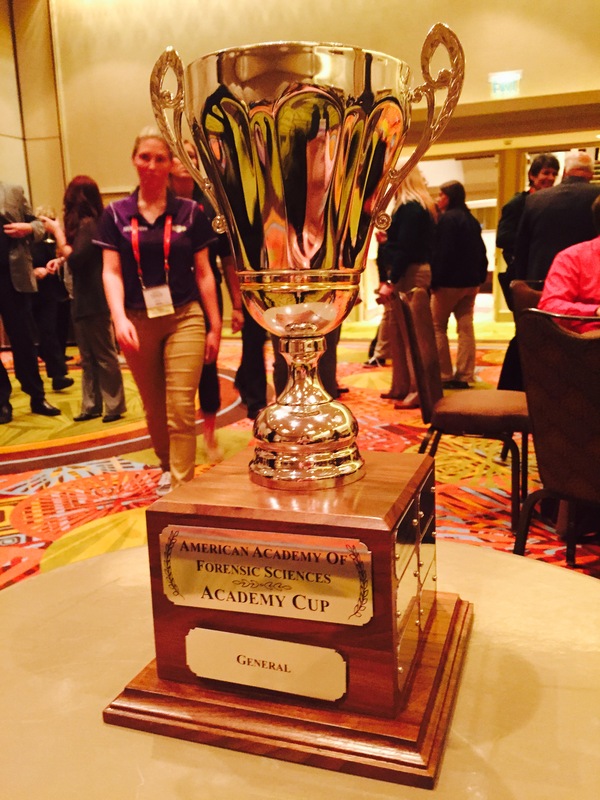 At the AAFS Annual Business Meeting on Wednesday afternoon, it was announced the General Section team won the Academy Cup! Congratulations to the team members for not only participating, but combining their forensic science and AAFS knowledge to WIN the 2nd annual Academy Cup competition. The team members included: Claire Shepard (team captain), Alan Boehm, John Gerns, Paul Kish, Gina Londino, Julie Howe, Amber Riley, Brian Clark, Janean Fossum, and Betsy Maldonado (YFSF representative). A huge thank you goes out to Program Chair Steve Clark and Program Co-Chair Steve Chancellor for developing an outstanding scientific program. The contributions of our members to the poster and oral presentations are what makes the program a success. Thank you to all presenters who showcased many of the disciplines of the General Section. The Academy reported that 170 General Section members registered for the meeting. Remember that attendance at the section business meetings is required for promotion. At the business meeting, Claire Shepard was elected Section Chair and Joanna Collins was elected Section Secretary. Other details of the business meeting will be published in the minutes and future news articles. The 2016 Section Program Chair is Arthur “Steve” Chancellor and Melissa Connor will serve as Co-Chair. Even though it is said every year, it is not too early to start planning your presentation for next year, as the August 1st abstract submission deadline will be here too soon. Remember, only completed submissions are accepted and CVs for each presenter have to be included. Thus it is necessary to familiarize yourself with the process before the deadline. 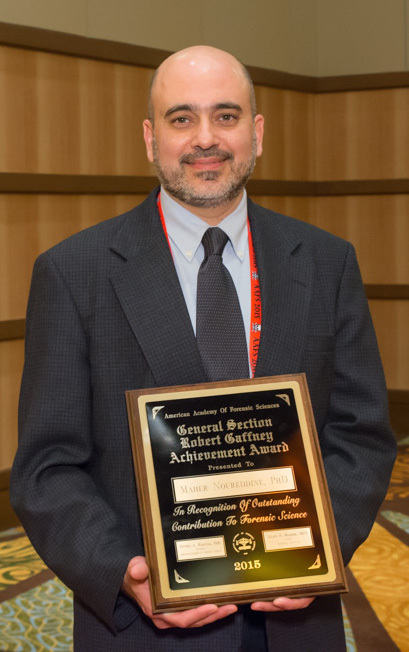 Also, please review the qualifications of the Robert Gaffney Achievement Award, and if you qualify, consider submitting your presentation for consideration. 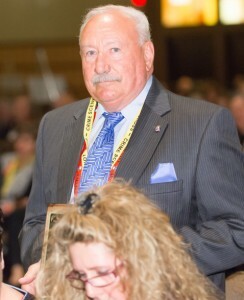 2015 General Section Award Winner: Vernon Geberth – Paul W. Kehres Meritorious Service Award. Congratulations to our 2015 section award winners. 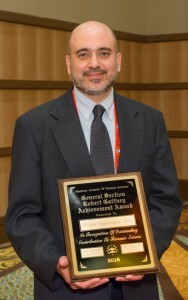 Maher Noureddine was awarded the Robert Gaffney Achievement Award which was designed to promote continual professional growth in forensic science and to encourage new forensic science professionals in their occupational specialties. The Paul W. Kehres Meritorious Service Award, which recognizes exceptional service to the section, was presented to Vernon Geberth. Finally, Paul Kish was legitimately surprised when he received the Robert Thibault Award which recognizes those members who place the needs of others and the section ahead of personal interest, promotion and adulation. Congratulations! Additionally, AAFS Membership Coordinator Cheryl Hunter, presented Virginia Lynch with the Kenneth S. Field Award for Outstanding Service to AAFS Staff. The Awards Committee would also like to congratulate Catherine Rushton as the 2016 Robert Gaffney Achievement Award Winner for her oral presentation in Orlando titled, “Multidimensional Model for Assessing Student Achievement.” She will receive complimentary basic registration at the 2016 Annual Scientific Meeting and will receive formal recognition at the meeting in Las Vegas, NV. Thank you to all who submitted their abstracts and a special thanks to the Awards Committee members for their hard work. 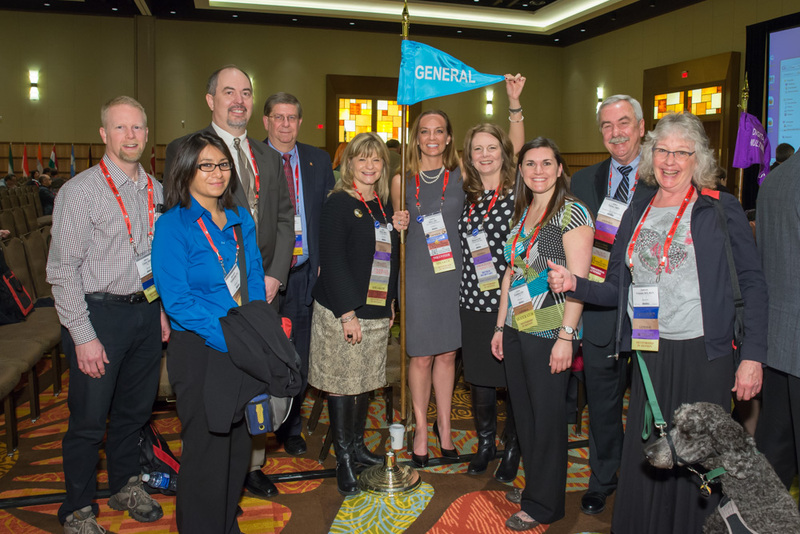 On Wednesday night, the General Section hosted another great reception for its members. If it were not for your FOGS (Friends of the General Section) donations the quality reception we continue to enjoy would not be possible. Melodie Brooks, reception committee chair, collected over $2,000 from members to be used towards the 2016 reception in Las Vegas. If you would like to join FOGS and sport the ever coveted FOGS flashing pin at the 2016 meeting, you can still donate! Make checks payable to AAFS, annotate FOGS donation in the memo line, and send to AAFS along with a copy of a completed Agreement for Commercial Support of Continuing Education (available from AAFS). 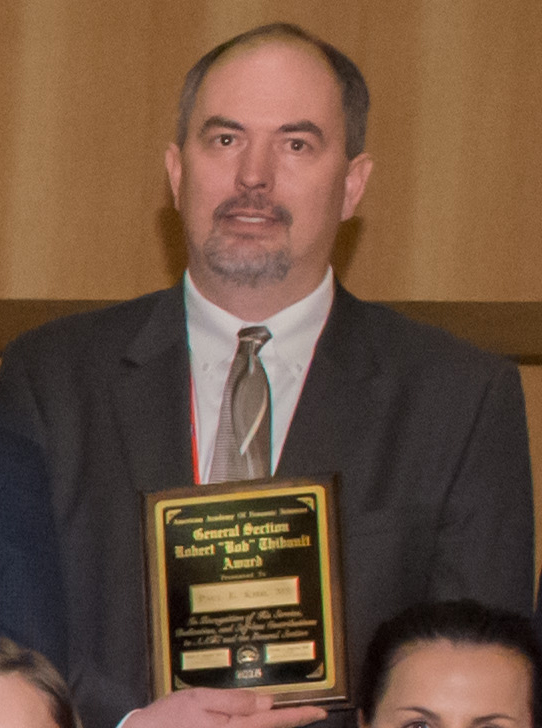 2015 General Section Award Winner: Paul Kish – Robert “Bob” Thibault Award. The Forensic Sciences Foundation (FSF) continues to support the forensic sciences through the funding of research projects. However, the General Section is under represented in research submissions – please consider furthering your research and education by submitting a proposal for grant funding. During the section business meeting, the General Section voted to donate $2,000 to the FSF and $250 to the FSF Scholarship for the upcoming year. We also voted to donate $500 to the YFSF and recognized General Section member and YFSF President, Lara Frame-Newell, for her service to the YFSF. We all look forward to serving you in the coming year. We are already preparing for the Las Vegas meeting and are working on the recommendations made by the Long Term Planning Committee. As such anyone who would like to serve on an ad-hoc Communications Committee, please contact Claire Shepard at Claire_e_shepard@yahoo.com. We’ll also work toward sharing information reflecting the theme of the 2016 meeting, Transformation: Embracing Change.